Tyres. We all use them. Some of us only know that they are black and round, others, like myself, sad fact, can tell a motorcycle tyre by its tread. I am a Michelin fan, I’ve used them for years. I had a brief period of using Bridgestone until I discovered the PR range from Michelin merely by chance, as the bike that I had purchased at the time came with PR2’s fitted. Even though they weren’t brand new I came to like the way they handled compared to any other tyre I had had in the past. The PR2’s used bi-compound technology (to Jo Public this meant they had a dual compound, softer on outside wall and harder in the middle where the contact patch is) these tyres were introduced to road bikes after Michelin developed the PR2 in the Moto GP circuit. They offered good long life wear and had excellent all weather usage. Michelin then brought out the PR3 to replace the older PR2, these were advertised as having better grip in the wet. My bike at that time was a 2009 Honda Hornet which had come with Bridgestone tyres fitted as standard from new, so when the time came to replace it’s tyres I naturally had to try the new PR3. Living in Scotland if a tyre is advertised as having excellent wet weather grip it seemed silly not to give them a try. I was instantly impressed, straight away I had plenty of feedback from the easy going contour of the tyre, and when on tour in Germany I rode through some horrific weather one day, to the extent that the roads were like rivers, not once did I have any issues or loss of confidence, they performed excellently to the extent that I had 3 sets of the same tyres fitted to my Hornet, each time obtaining between 7 and 8 thousand miles per set. 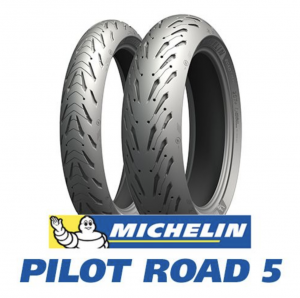 A few years go by and Michelin have been developing the PR3’s replacement, the PR4. This all new triple compound tyre was advertised as a breakthrough for Michelin in the tyre world, a premium touring all weather tyre, which again was billed as having better wet and dry grip, and lasting 20% longer than its predecessor. The tests showed that a worn PR4 would stop in the same distance as a brand new PR3 whilst under heavy braking. The tread pattern was like no other, the chamfered edges on the front tyre were to prevent abnormal wear in extreme conditions. I have to admit though that I did not get on with the all new Pilot Road tyre, I had them fitted to the new CBR650F, and I found that the design on the front tyre after 4 thousand miles looked what I can only describe as “feathered?”, I also found that the more extreme contour of the tyre made the bike “tip in” too eagerly, now I know some people like this and don’t mind their bike cranking over with little ease but I personally like to work the steering more, I thought they made the bike too “flighty”, so needless to say once it was time to replace the PR4’s I actually reverted back to PR3’s on this bike as I preferred the way they handled over the new model. Which brings me up to date and on my current bike a CB1000R, again came with Bridgestone T30 EVO fitted as standard from the factory, now I actually quite liked these at the time and when I was faced with replacing them I was in a quandary as the new PR5 had only just been released and there were no reviews on the internet to help me make my decision. Now after trying and disliking the PR4’s I took a gamble and went with trying out the new tyre which was now named Michelin Road 5. Instantly the tread on this tyre looks somewhat different to any other, it has Michelin’s patented ACT+ casing technology. Even when 50% worn, a Michelin Road 5 tyre stops as quickly as a brand new Michelin Pilot Road 4 tyre, thanks to the evolutionary Michelin XST Evo sipes. I found these provided excellent feedback from every road surface, they weren’t as extreme with steering in to corners as their predecessor and they offered improved grip and stability, I managed only 6 thousand miles from my 1st set, now this wasn’t due the tyres squaring off or becoming illegal due to excessive wear, in fact I had managed to pick up a rather nasty puncture whilst miles away from home, which was irreparable. I was informed that if the tyre was repairable it would have lasted another good 3 thousand miles or so, which in my book is pretty darn good going especially as the road surfaces in Scotland are much harsher than anywhere else in the UK. So again, naturally I replaced them with another set of Road 5’s and they have currently covered 2 thousand miles and look in excellent condition. So I hope to be able to report mileage at some point this year as another tour of Germany is calling in the summer. I don’t think there will be a Road 5 replacement for a few years yet but rest assured when there is I shall be trying them out too! Would you like to read more reviews?